CHICAGO — Determining the oldest tree in Chicago has seemingly stumped the city's nature experts. Most of Chicago's forests and prairies were wiped out in the 1800s. By 1900, most of the land in and around the city had been turned into farmland and residences, with small green strips and patches of forest remaining. Of what remains, no one appears to know what is actually Chicago's oldest tree, although there are ideas. Of course, it's hard to back up hypotheses since it's not possible to know the exact age of a tree without taking a coring to count its rings. Drilling holes into trees is not typically done unless it's involved in a specific research effort. Standing trees' ages can be estimated if others with similar size fall or are taken down. Justin Breen chats about Chicago's oldest trees. One of the few guesses came from a 2009 article penned by Gary Ossewaarde, the Hyde Park-Kenwood Community Conference parks chair. 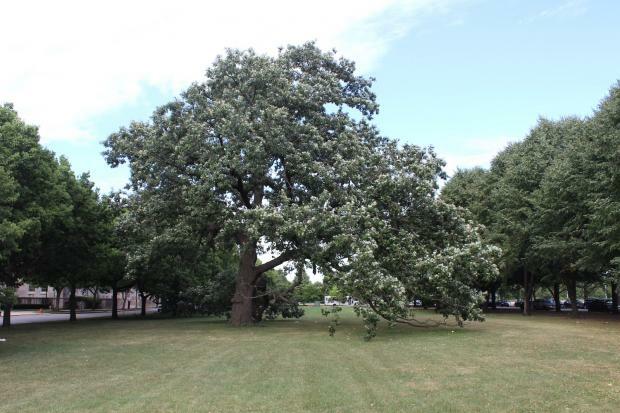 The article mentioned a giant, still-standing bur oak tree located in Midway Plaisance Park that is 250-plus years old near University of Chicago's Billings Hospital. That's possible considering the oaks in nearby Washington Park predate the earliest designs for the park by Frederick Law Olmsted in 1870, and bur oaks can live up to 400 years. But Ossewaarde said via email that he got the information second-hand and that there may have been an oak even older in Lincoln Park. There is also a similarly sized oak tree in the University of Chicago Laboratory Schools courtyard, but the school's director of communications and an alumna, Catherine Braendel, said no one there could estimate its age. Officials from the Forest Preserves District of Cook County, Peggy Notebaert Nature Museum, Field Museum and Chicago Park District said they don't keep track of the ages of specific trees within Chicago city limits. There is more abundant information once outside city limits. The oldest tree in Cook County could be the "Champion" white oak in Pioneer Woods in suburban Willow Springs. John McCabe, the Forest Preserves District of Cook County's director of resource management, said the tree is around 300 years old. He determined that age using the tree's circumference around the trunk (16.2 feet) and diameter of the trunk (5.1 feet). McCabe also said there are several oak trees in the forest preserves' Palos region that are at least 250 years old. The oldest tree in the Chicago area may be the Millennium Landmark Tree — a white oak on the property of Morton Arboretum in suburban Lisle. 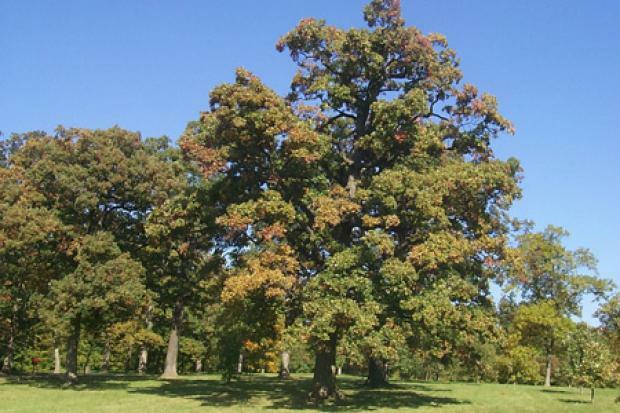 The Morton Arboretum's manager of plant records, Ed Hedborn, said that tree is likely more than 330 years old. A white oak in the same area and of similar size was taken down by a storm in the early 1980s, and the tree at that time dated back to 1682. The Chicago Region Trees Initiative next year plans to launch a "TreeMendous" tree competition next year with the goal of helping identify some of the largest and oldest trees in the Chicago region. The competition will include findings of a tree census of the urban and community forest of the seven-county Chicago region. The oldest tree in Illinois is a bald cypress tree in a Cache River swamp in southern Illinois. That tree is 1,000-plus years old, according to the Illinois Department of Natural Resources. Bristlecone pine trees in California are the country's and world's oldest trees, thought to be more than 5,000 years old. There are more than 500,000 trees on Chicago parkways alone, according to the city's Bureau of Forestry, but thousands of them are recently planted. A detailed analysis of trees in the Chicago region from the United States Department of Agriculture determined there are about 157,142,000 trees currently in the area. The most common tree species, according to the study are: European buckthorn, green ash, boxelder, black cherry, and American elm.